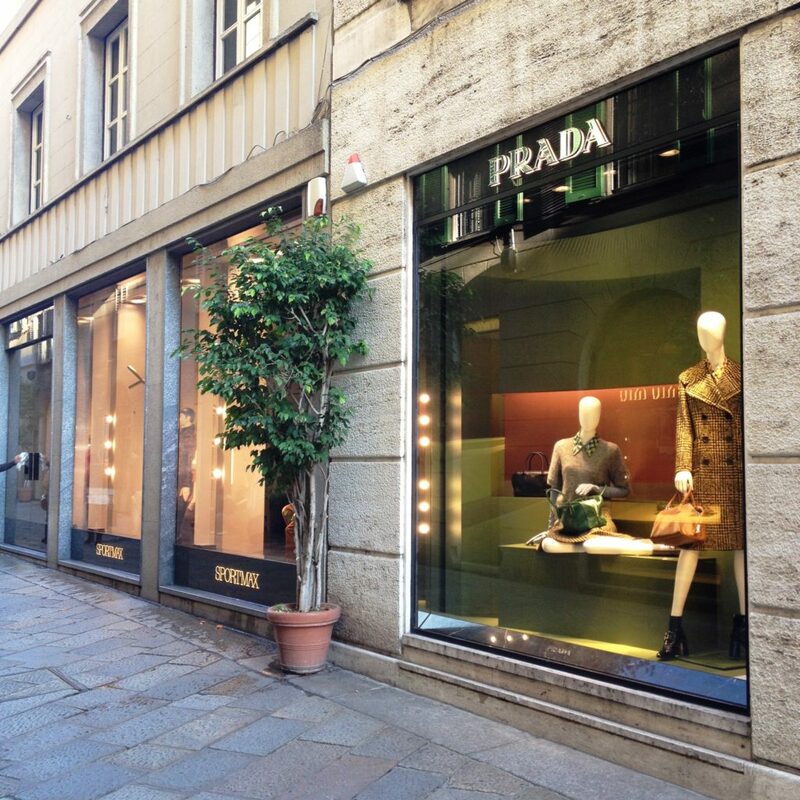 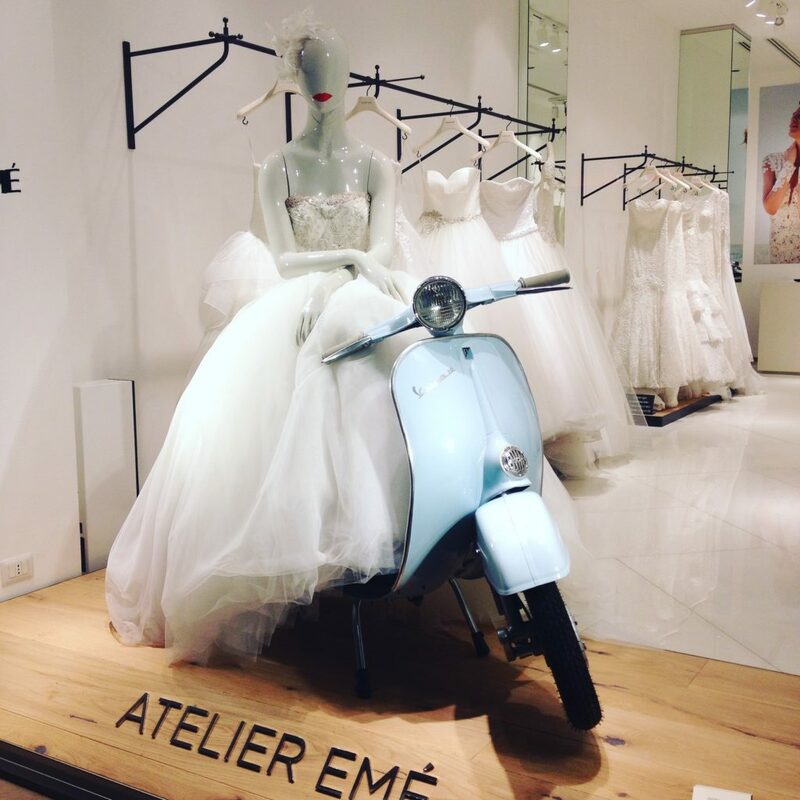 I started exploring Milan in the center and firstly walked around Quadrillatero della Moda; the fashion district where you can find all the top designers stores in Milan. 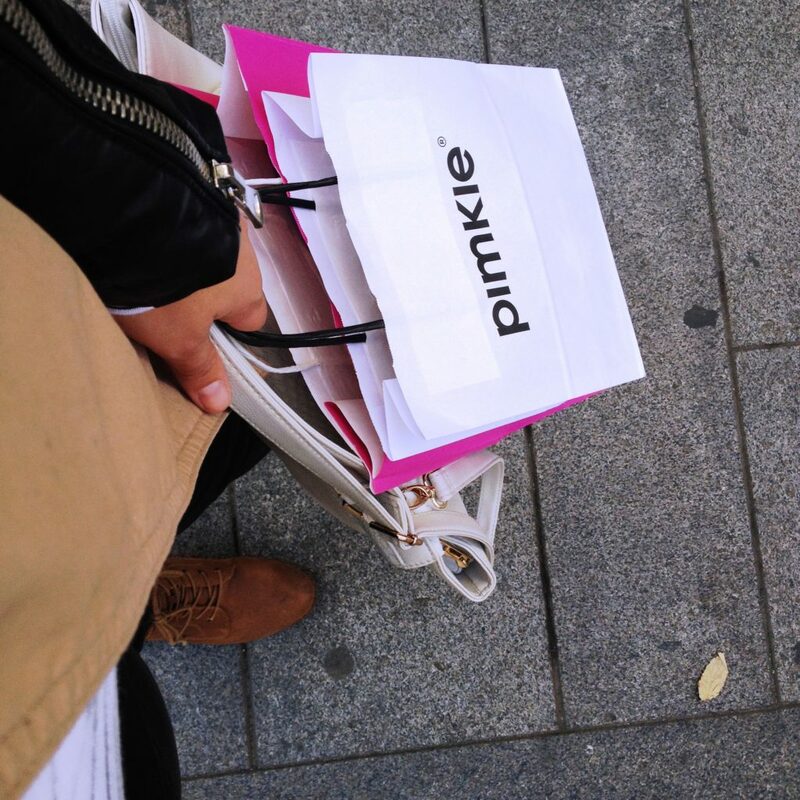 A trick for those who don’t intent to buy anything: I went there in the morning, before the stores open, and I had the perfect window-shopping without the crowds in my way. 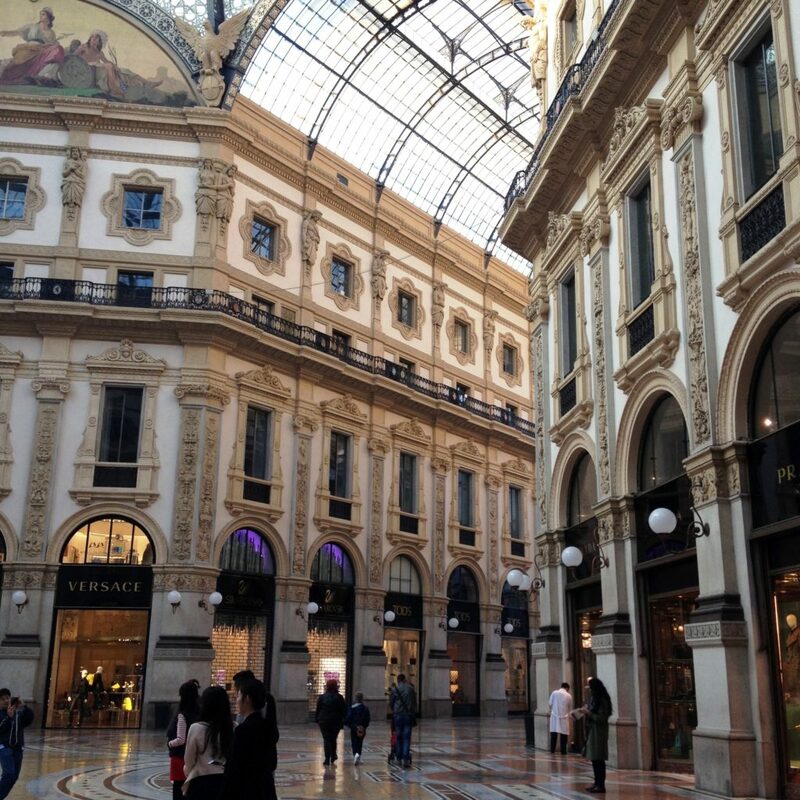 Then I continued past opera La Scala into Galleria Vittorio Emanuele II. 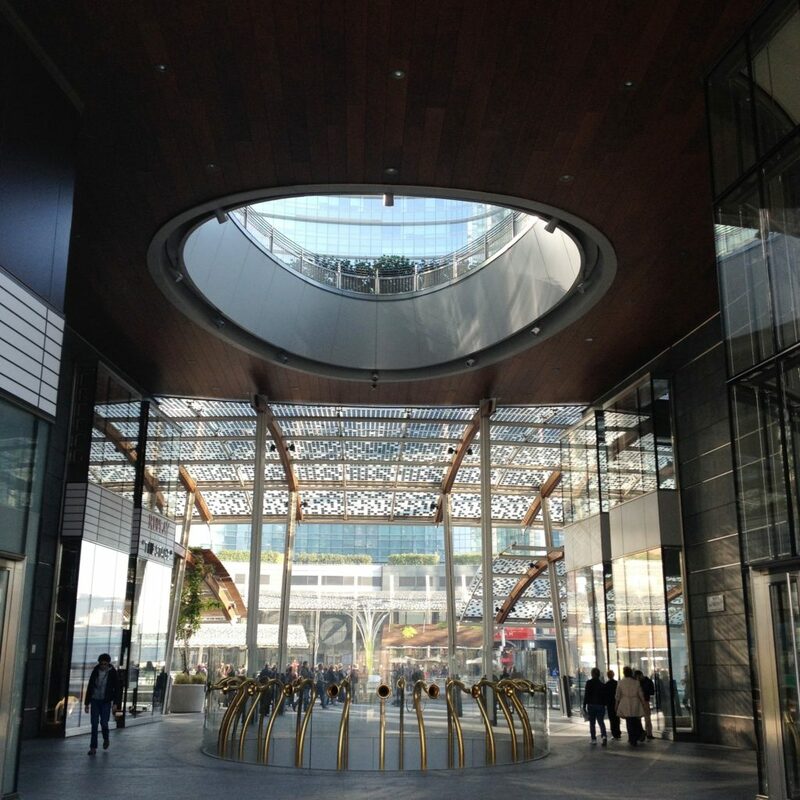 The architecture of this building is breathtaking; inside you can again find expensive fashion stores. 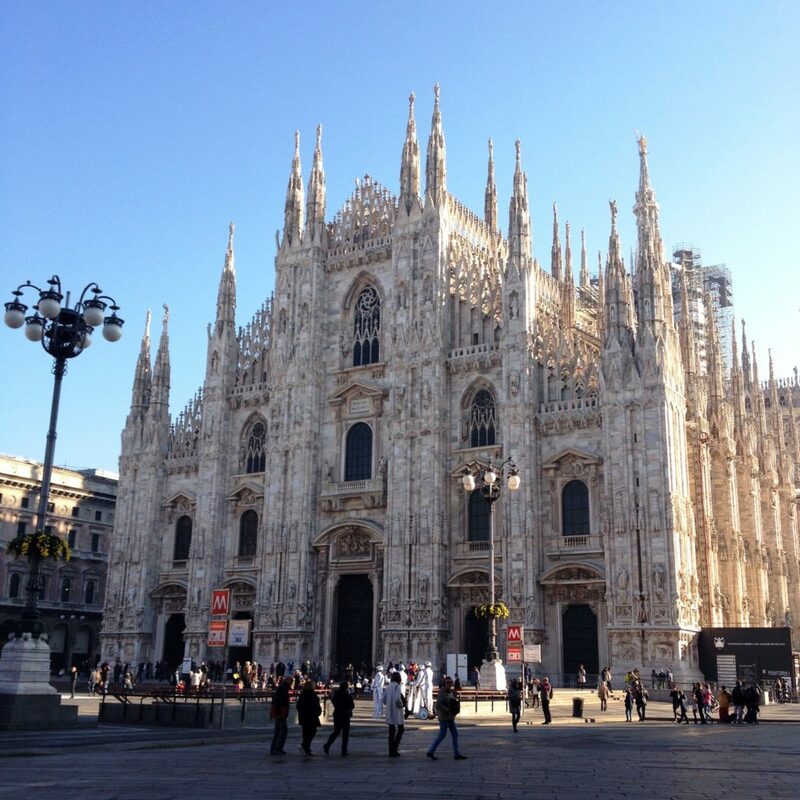 Next to the gallery there is the Duomo, huge cathedral that is worth taking a moment to admire. 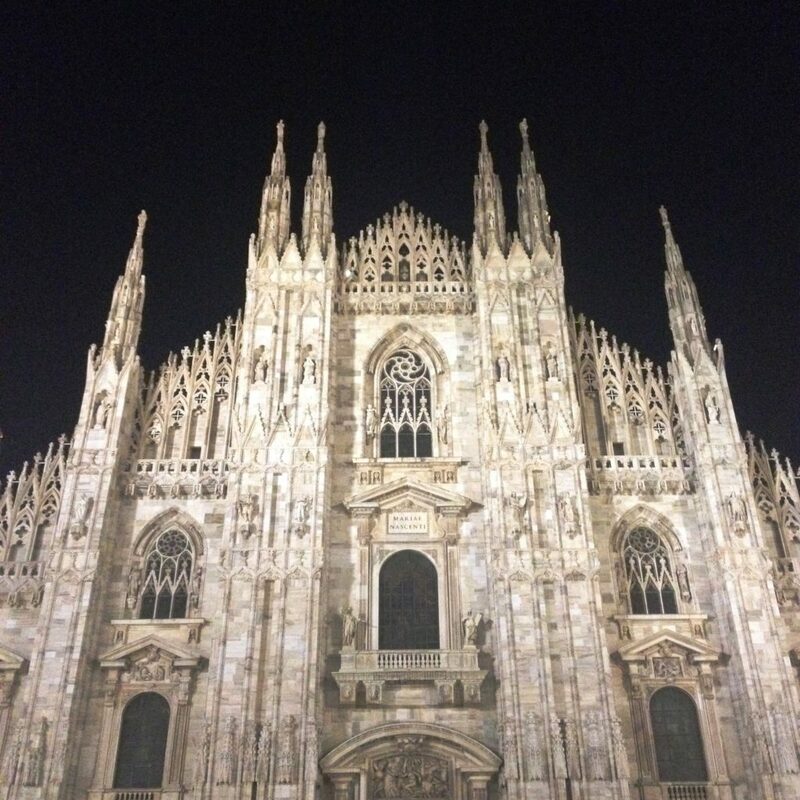 Its beautiful also at night. 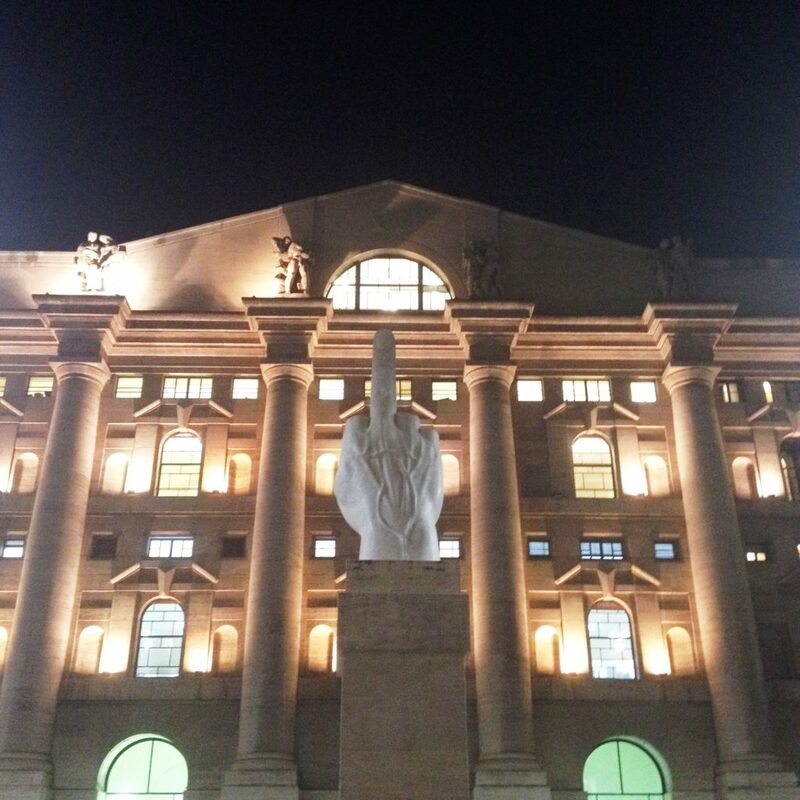 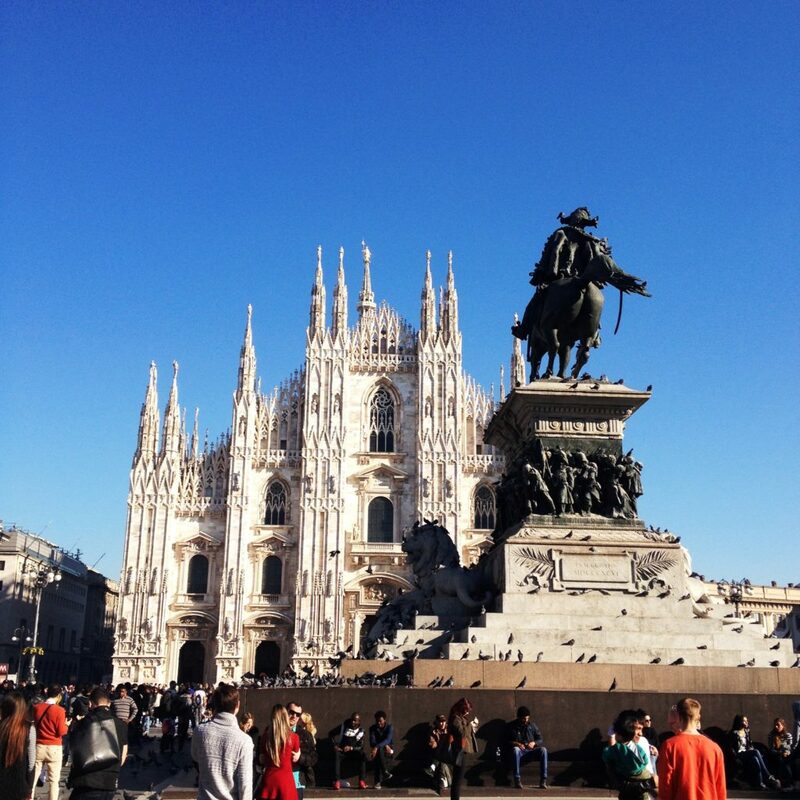 At the Piazza del Duomo there is also the statue of Italian king Vittorio Emanuelle II and the Royal Palace. 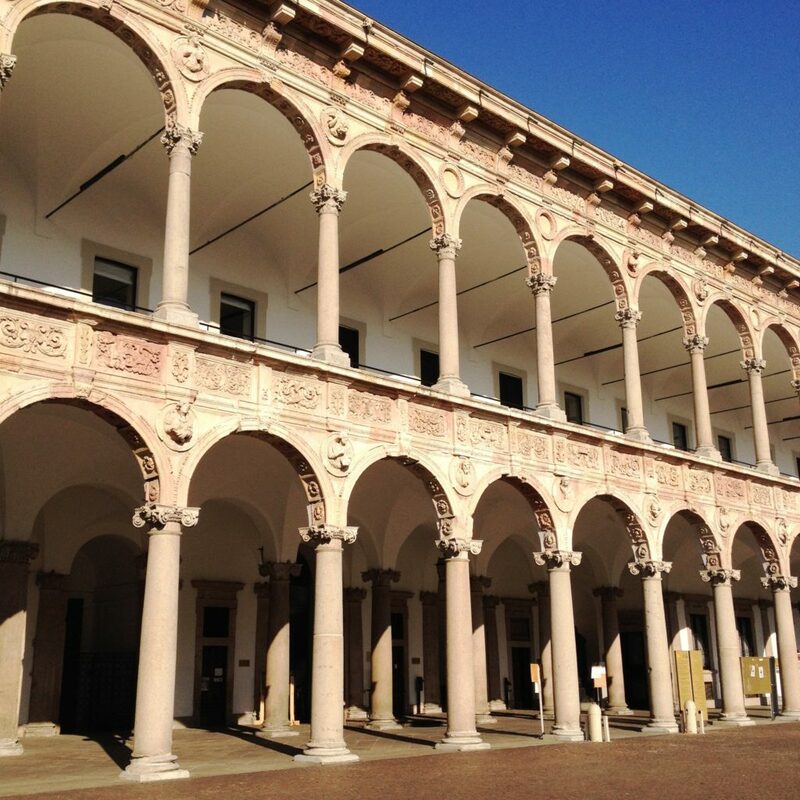 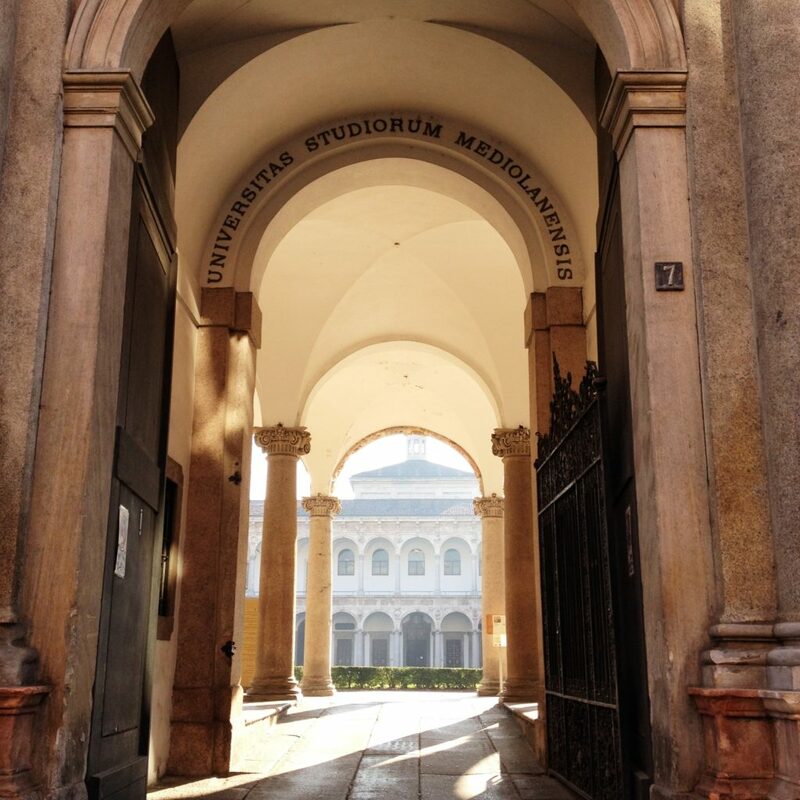 I continued to the University of Milan, beautiful building that I wouldn’t mind having my classes in. 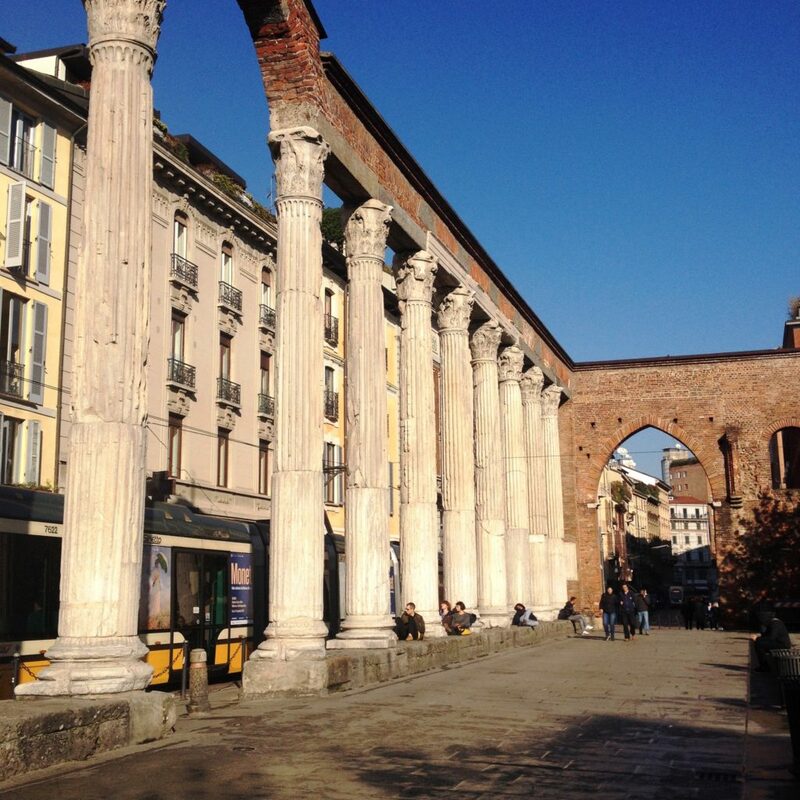 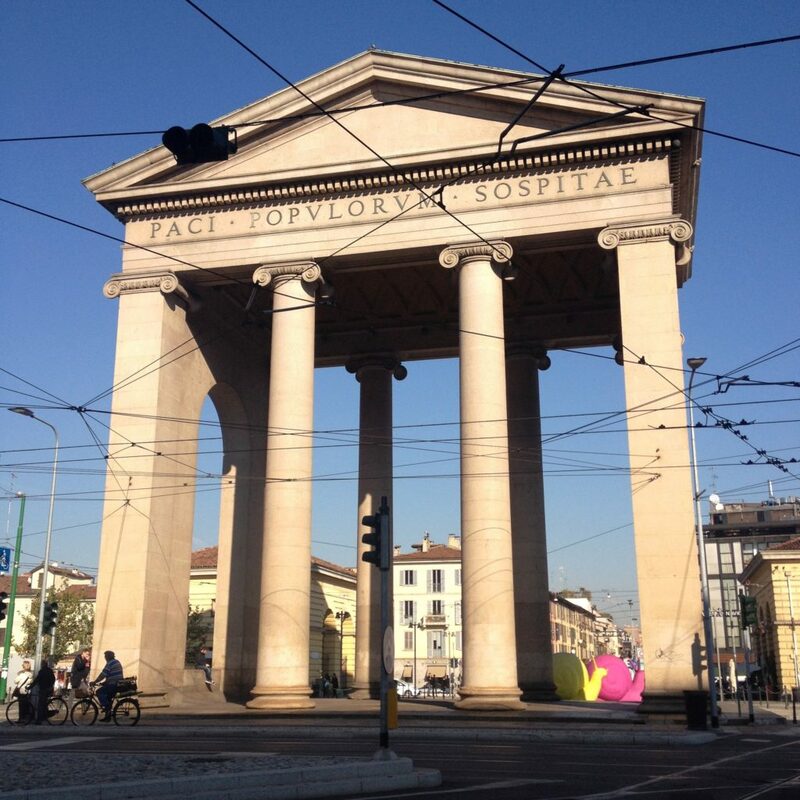 Next stop was Colonne di San Lorenzo, ancient roman ruins, and Porta Ticinese, one of many city gates of Milan. 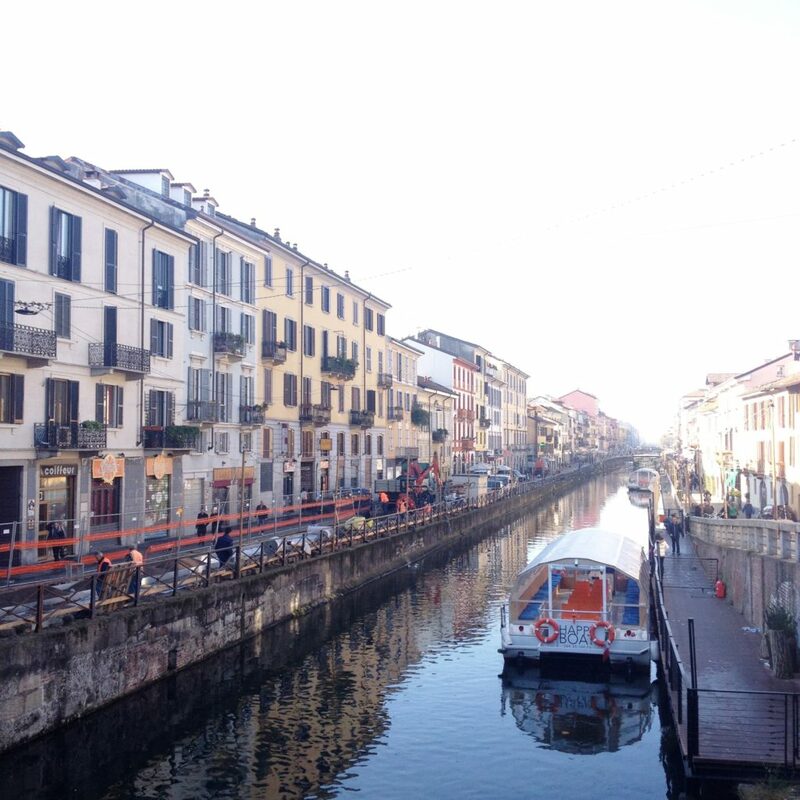 Here is also the start of Navigli, the canal district that reminded me of Amsterdam. 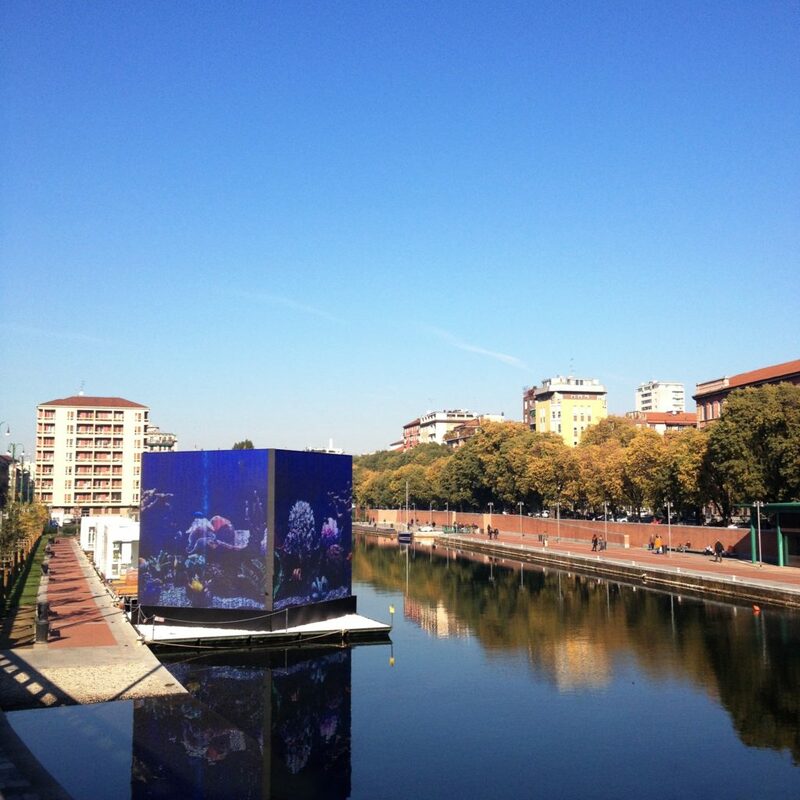 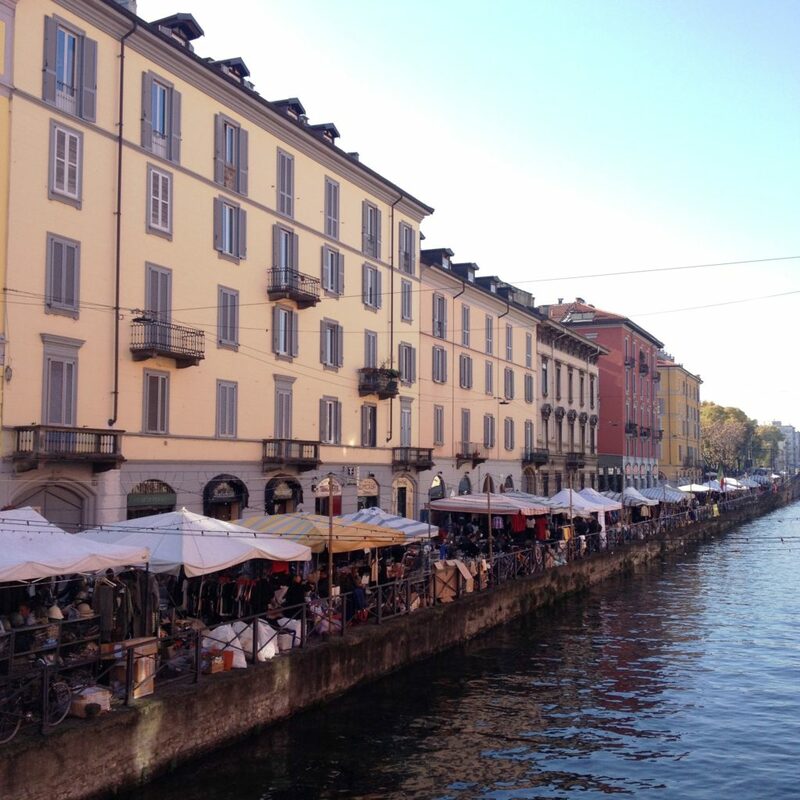 You can walk by Naviglio Grande, have a lunch in one of the restaurants or poke around the vintage market. 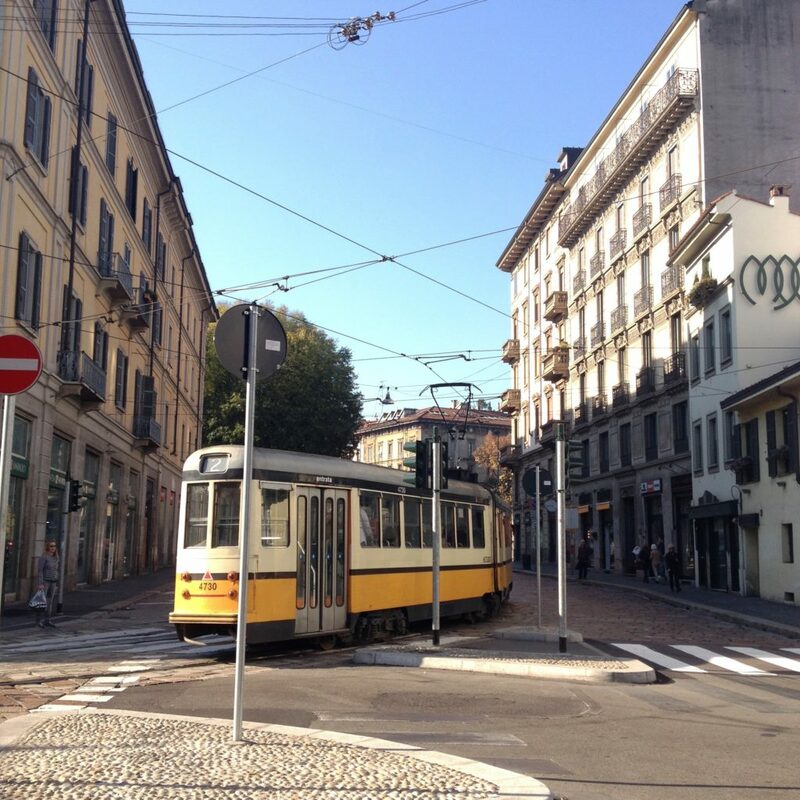 And walking here don’t forget to admire the yellow trams. 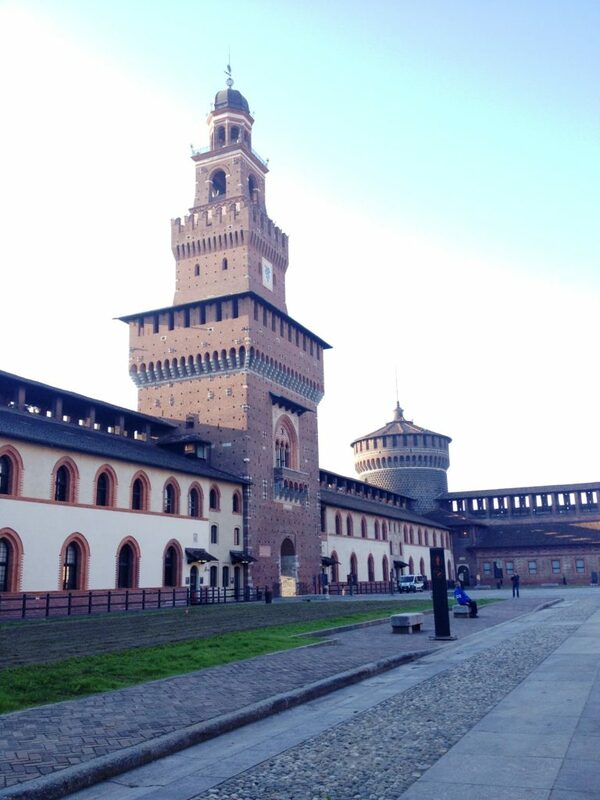 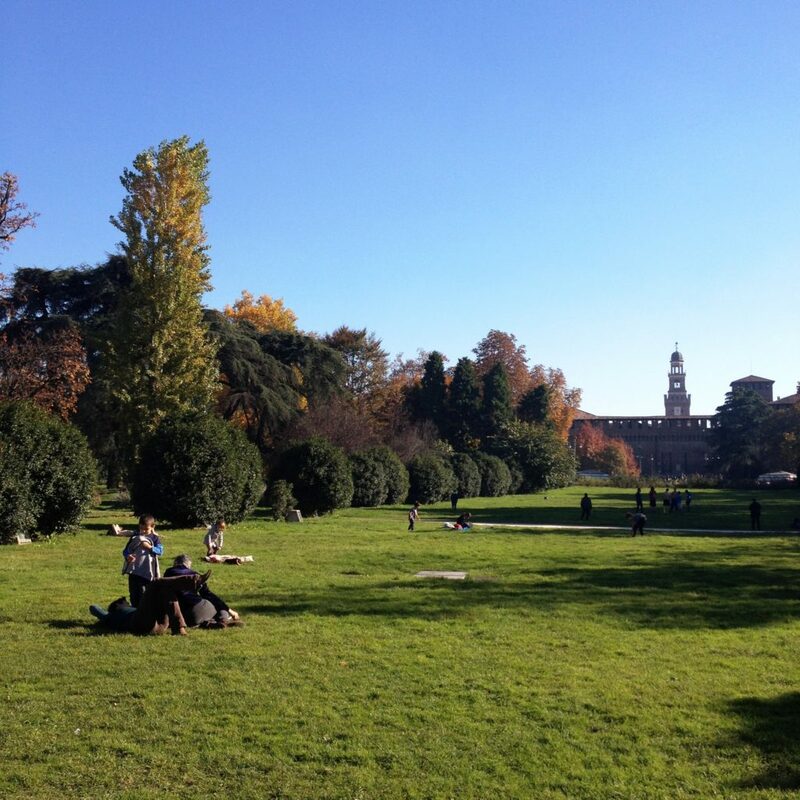 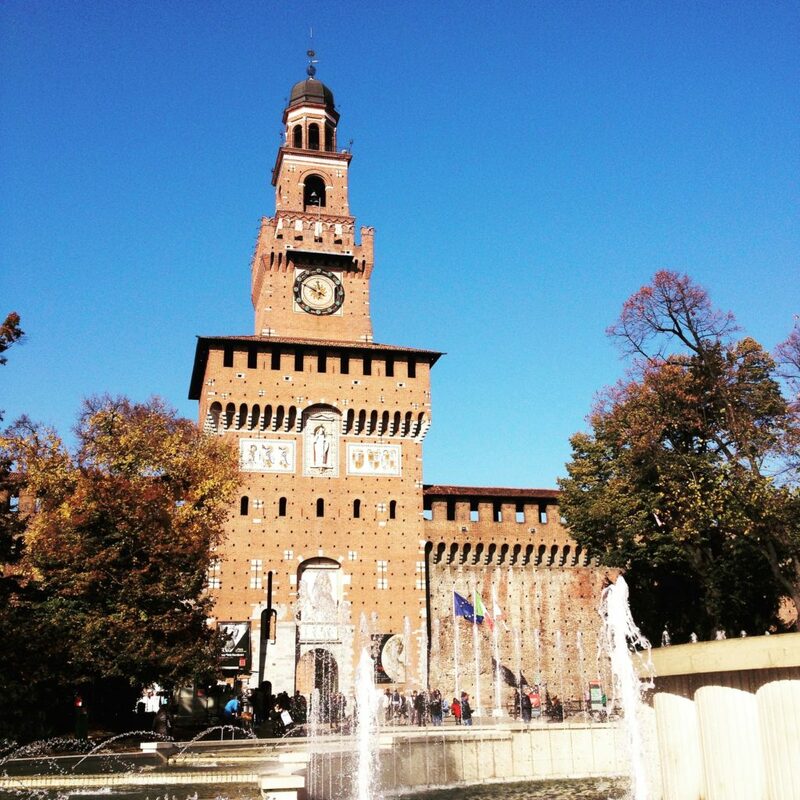 Half an hour walk away is another must see place – the marvelous castle Castello Sforzesco and behind it Parco Sempione were you can lay on the grass and enjoy the sunny days. 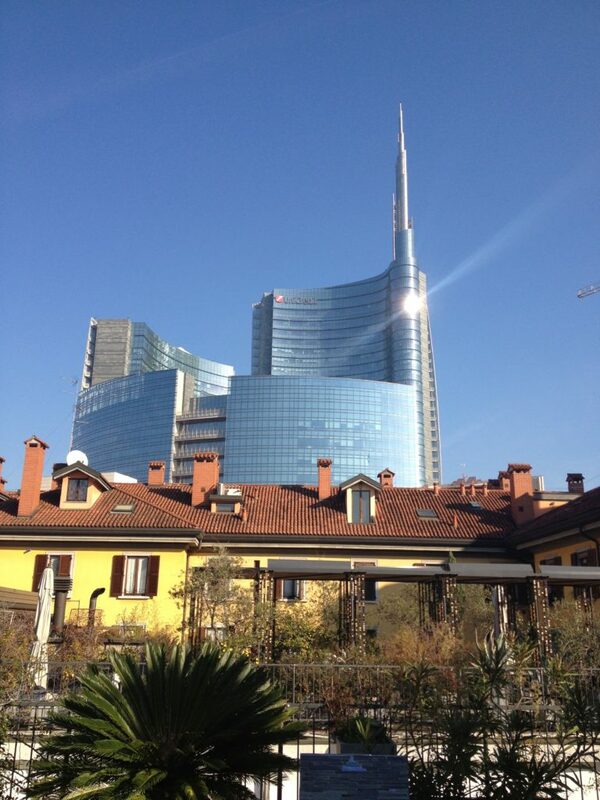 First day I ended with Italian pizza and ice cream in the city center. 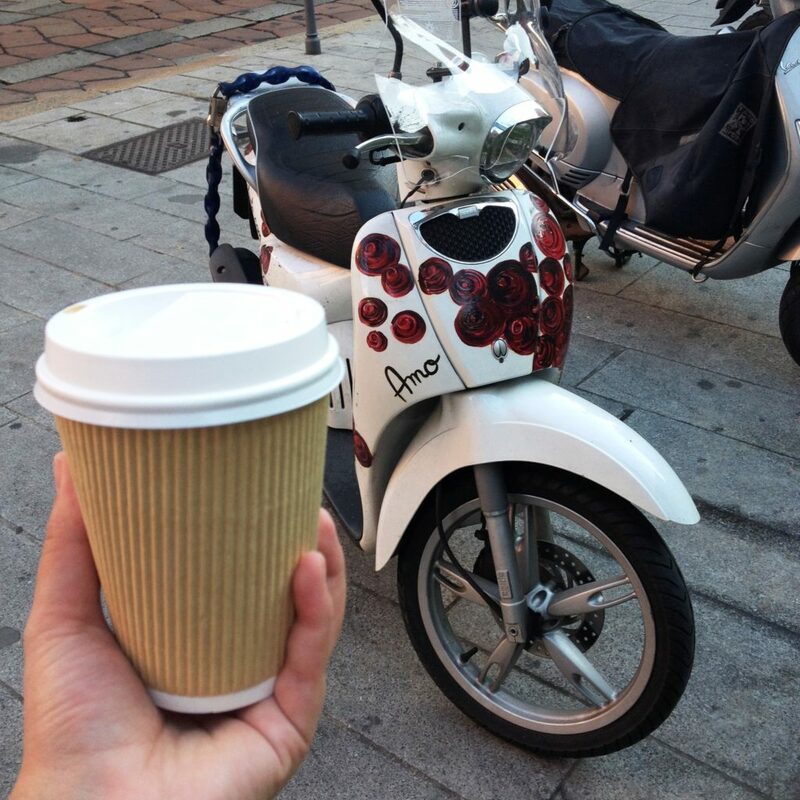 And yes, I took coffee to go and went shopping. 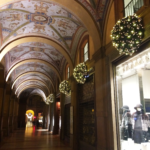 But I choose Via Torino street, which is a bit less crowded than shops around Duomo and it also has stores with prices for everyone. 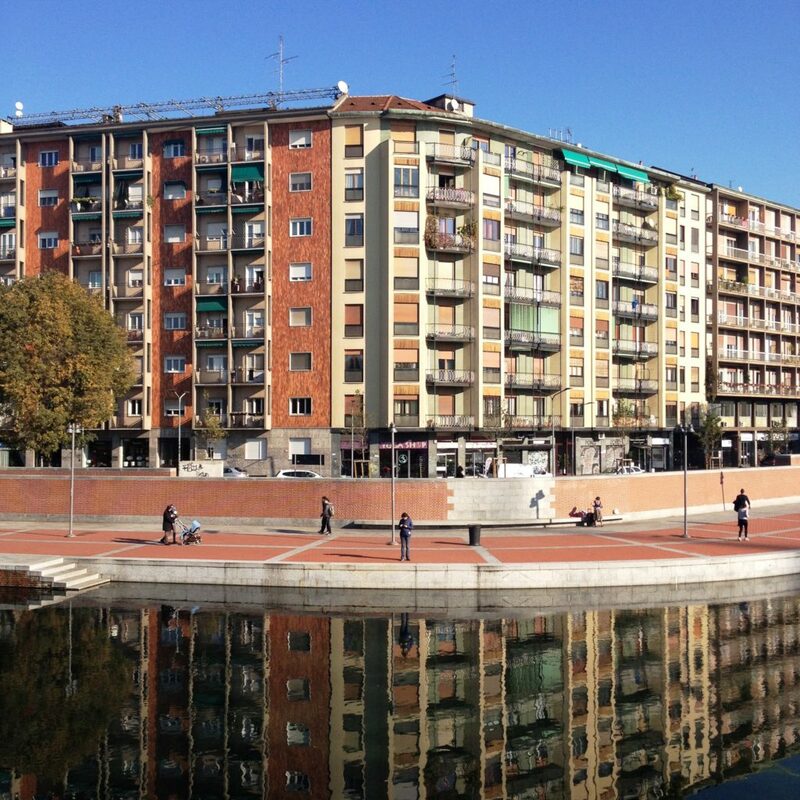 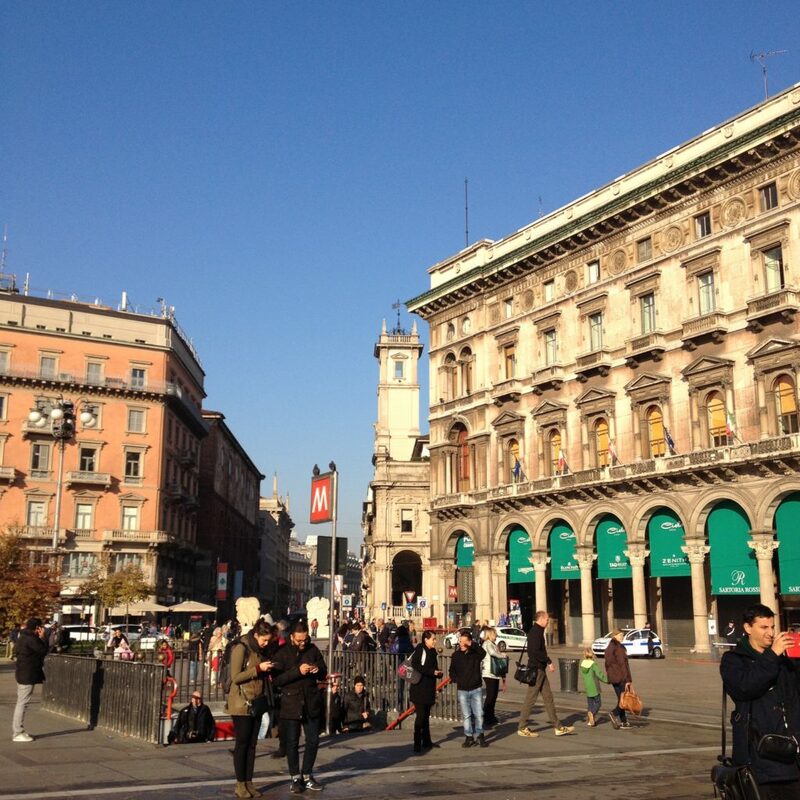 The second day I went to explore Porta Nova, Porta Garibaldi and Porta Volta parts of Milan. 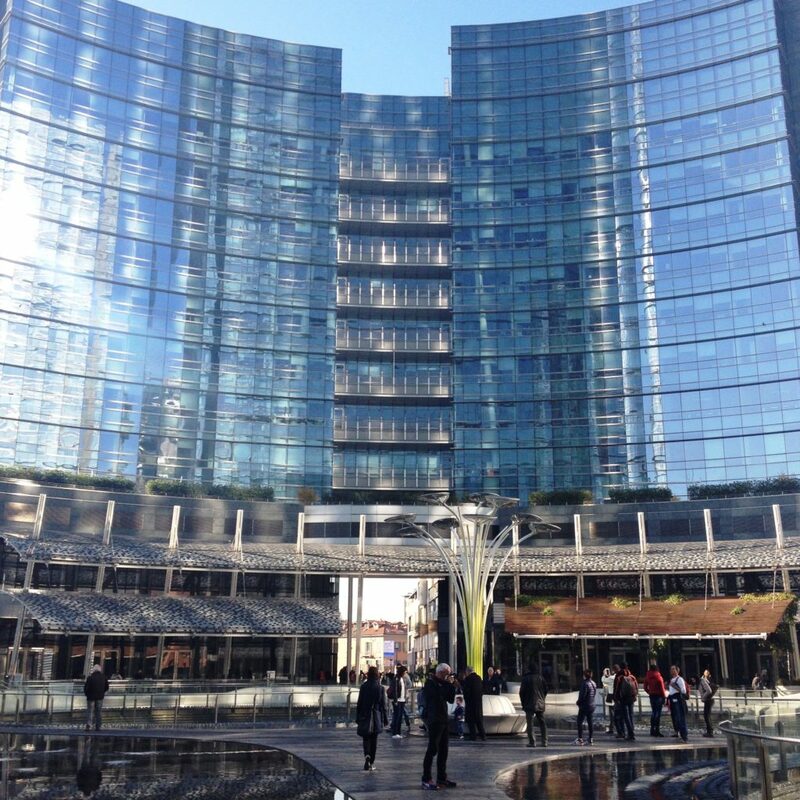 I was amazed by the skyscrapers at Piazza Gae Aulenti, which is really something to see. 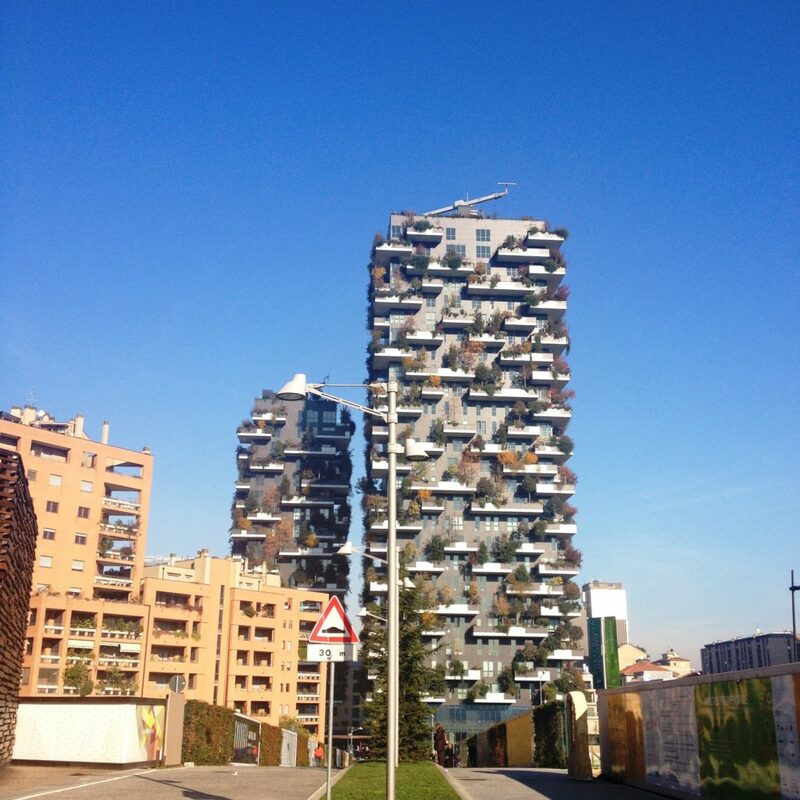 One of the surrounding buildings, named Bosco Verticale, which translates to vertical forest, has more than 900 trees on its terraces. 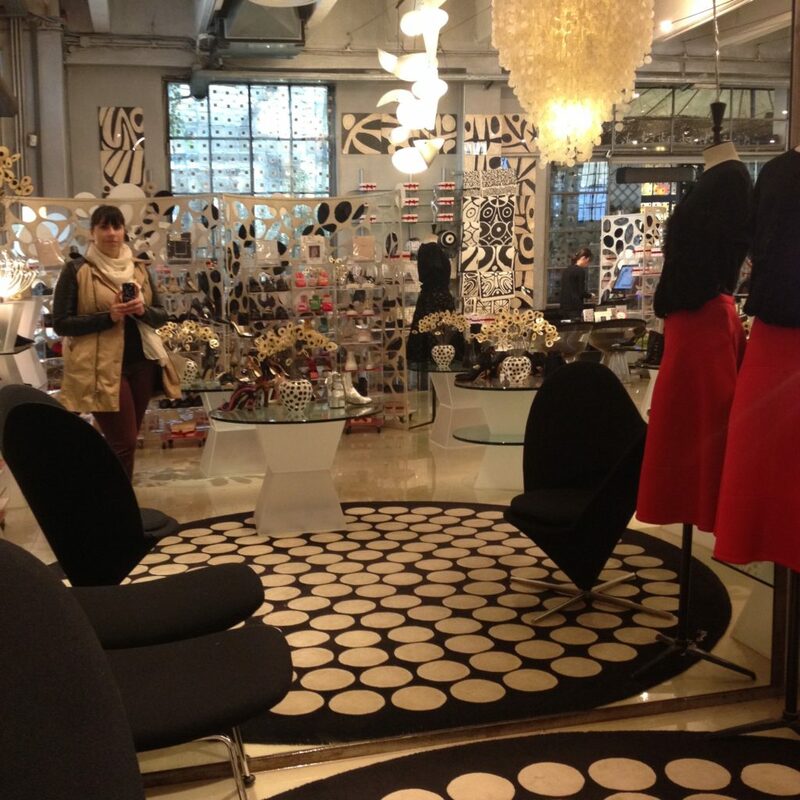 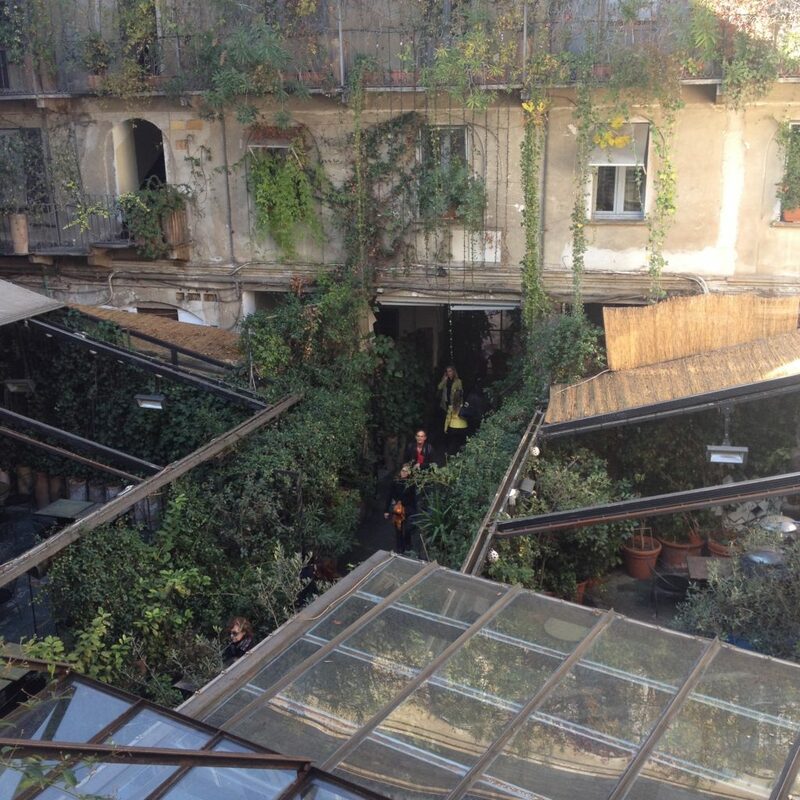 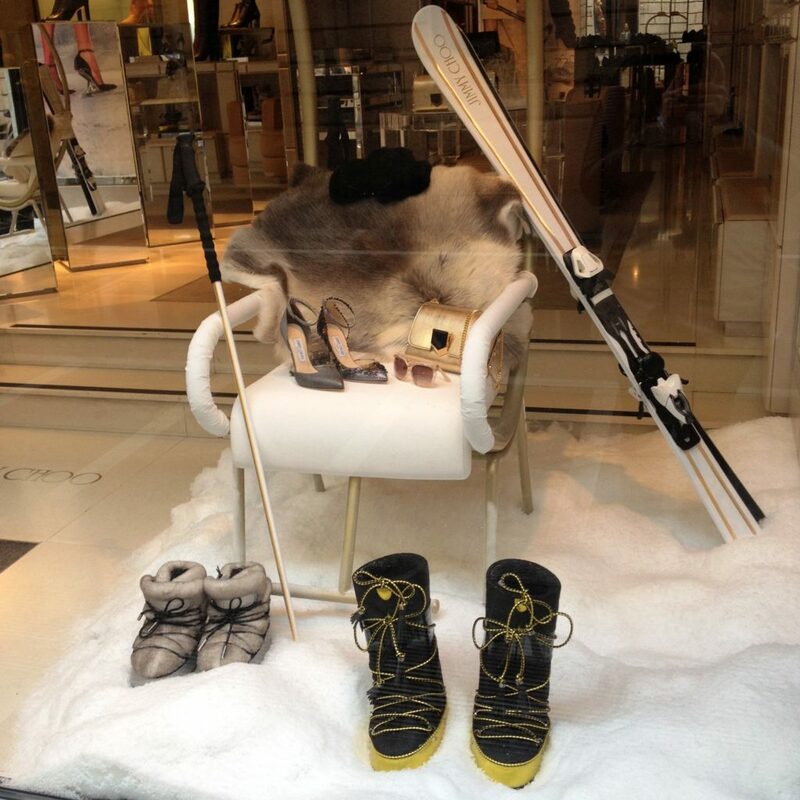 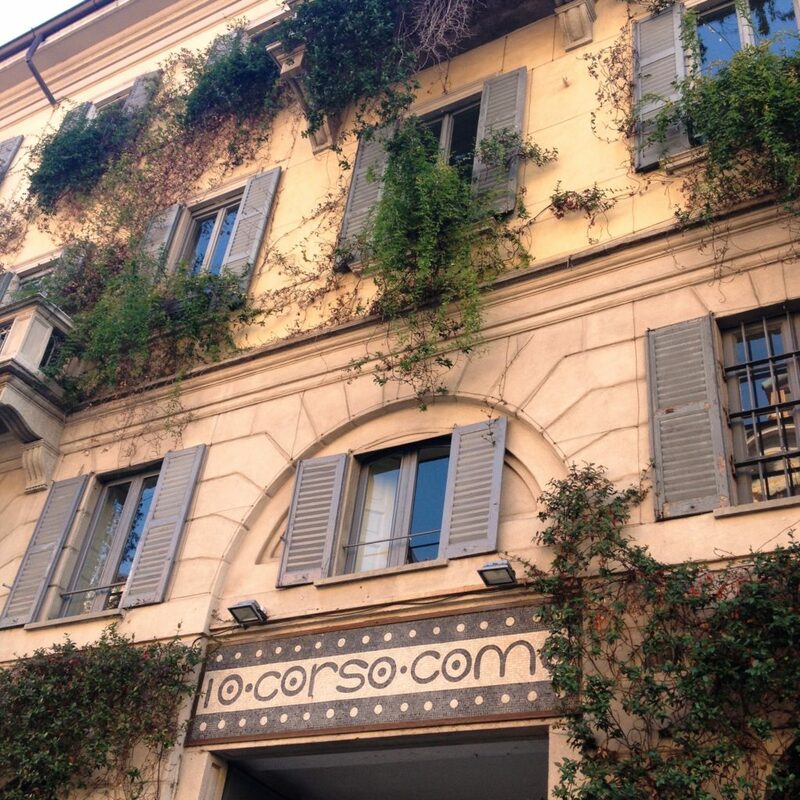 I also visited nearby 10 Corso Como store. 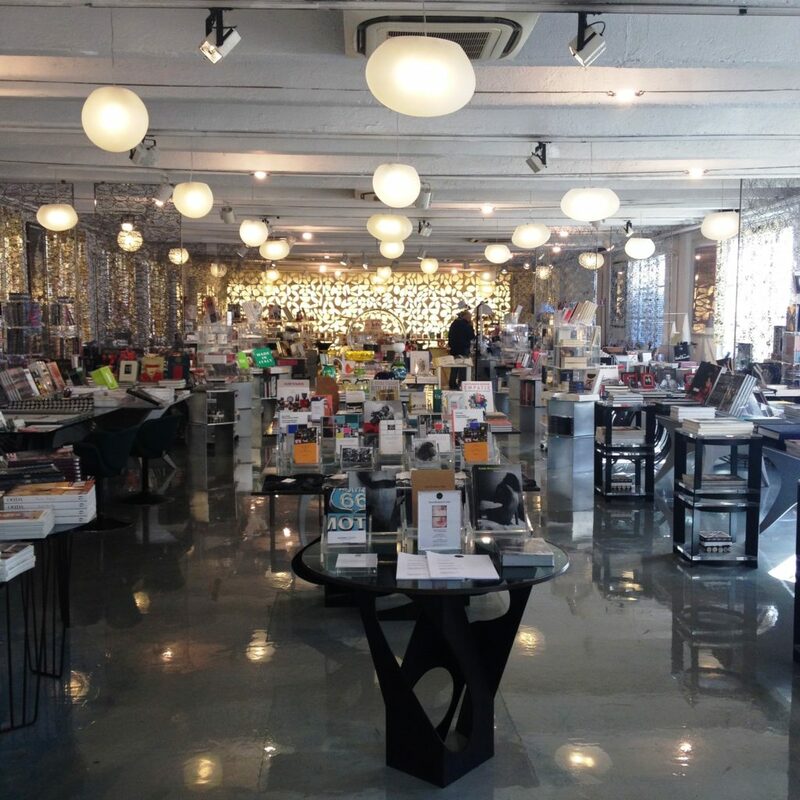 If designer clothes and interesting books don’t mean a lot to you, you should visit the rooftop garden which offers a great view. 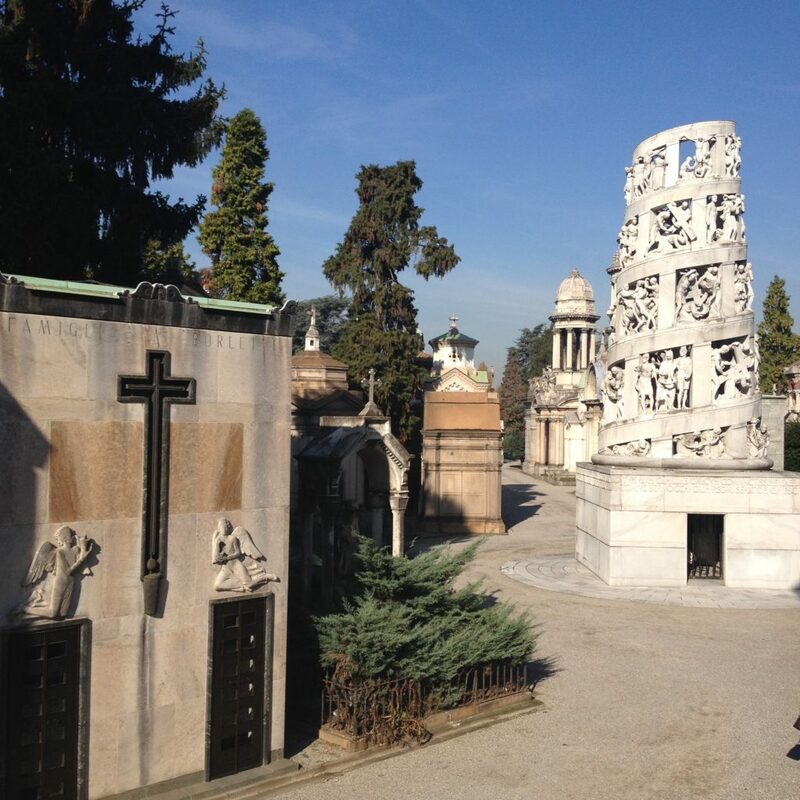 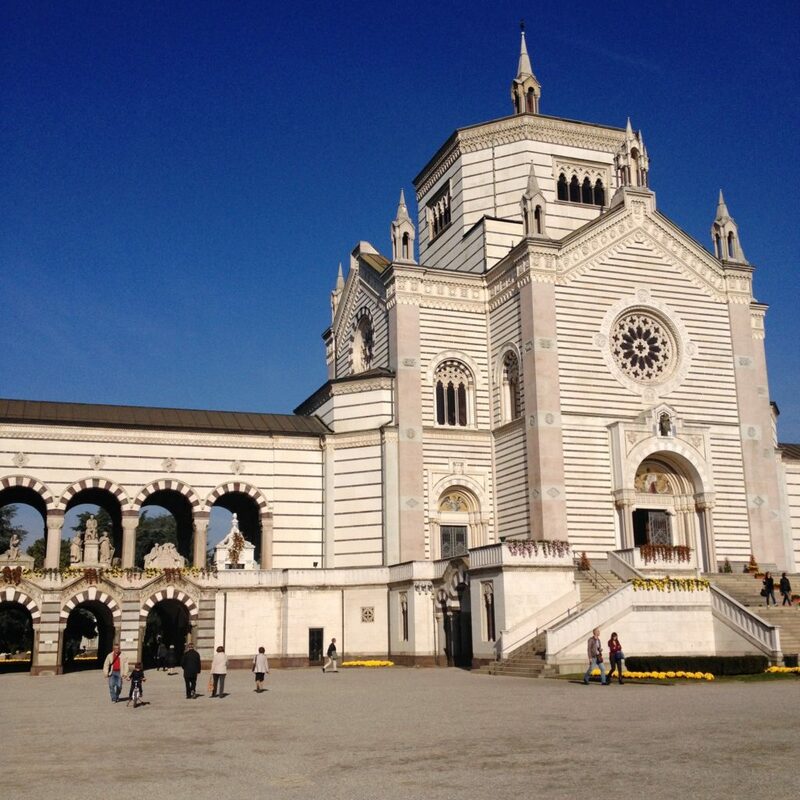 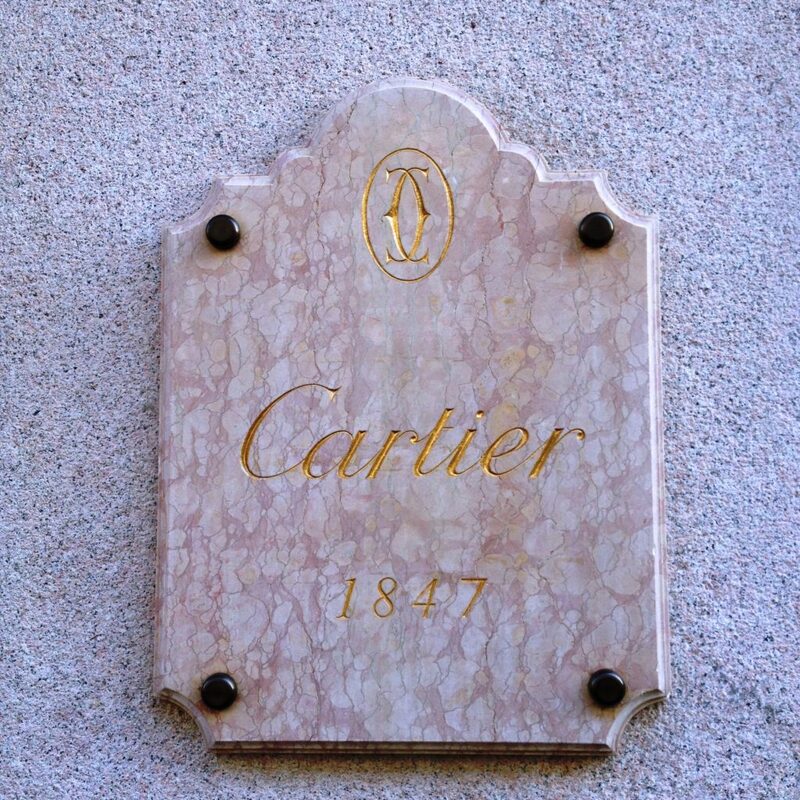 If you are in that part of the city, there is just 10 minutes walk to the Cimitero Monumentale, the monumental cemetery filled with big family vaults of old Italian families. 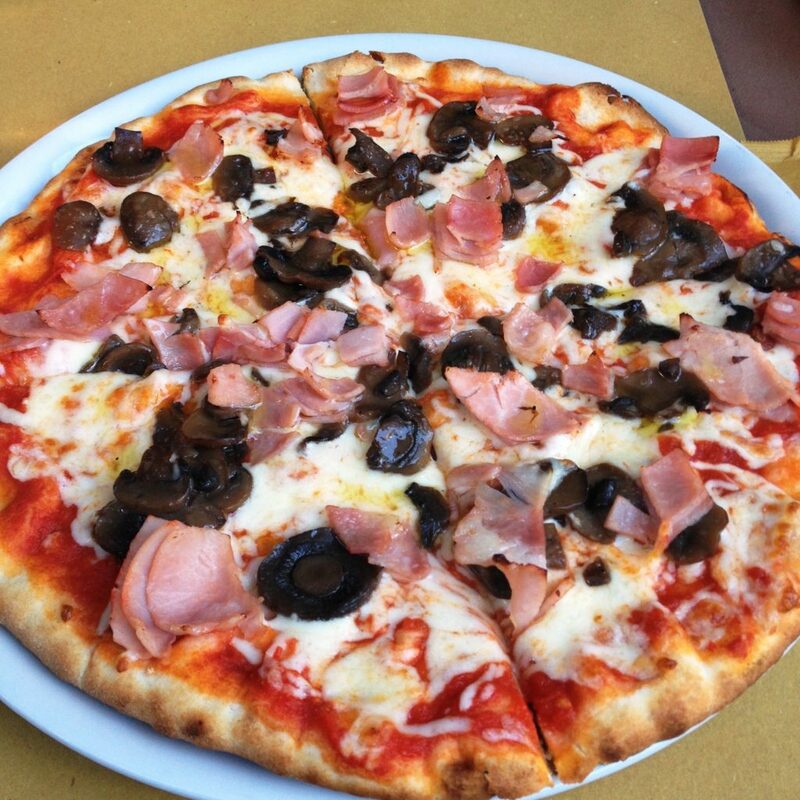 Time for a lunch – if you ate pizza yesterday, than today is a pasta day. 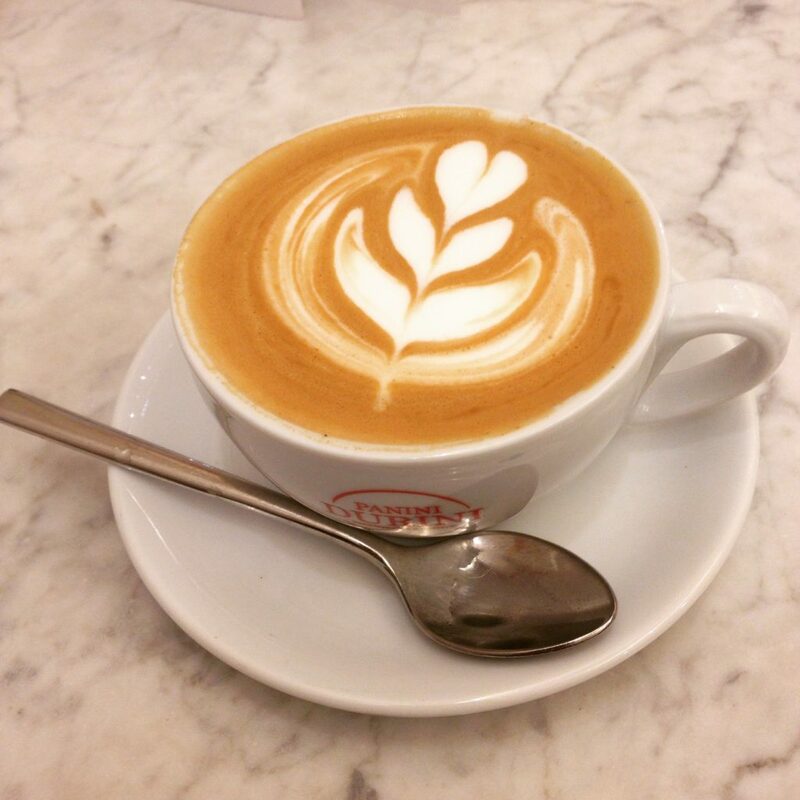 And you should finish it with great Italian coffee. 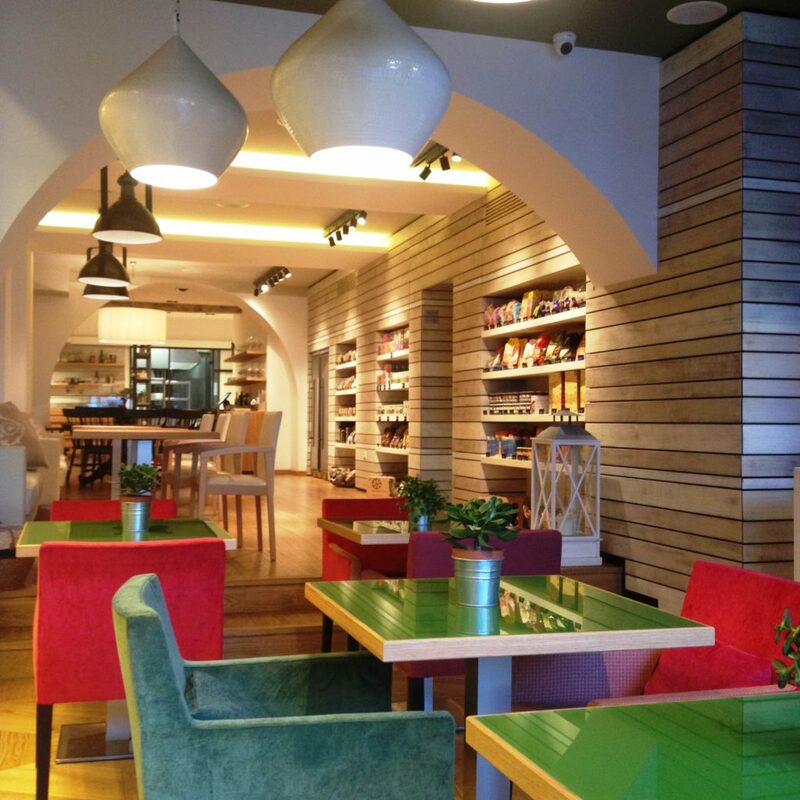 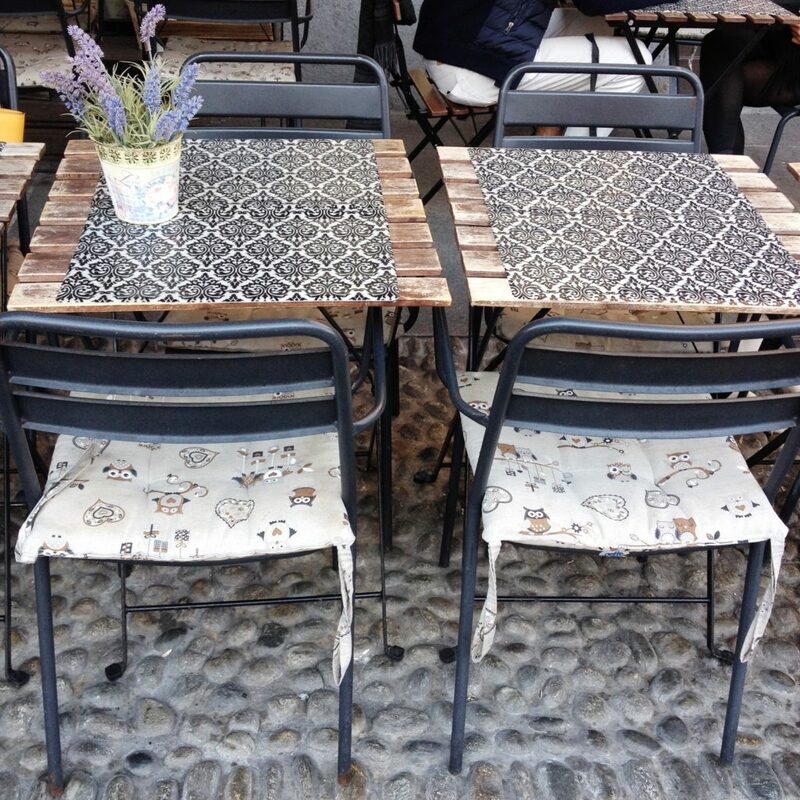 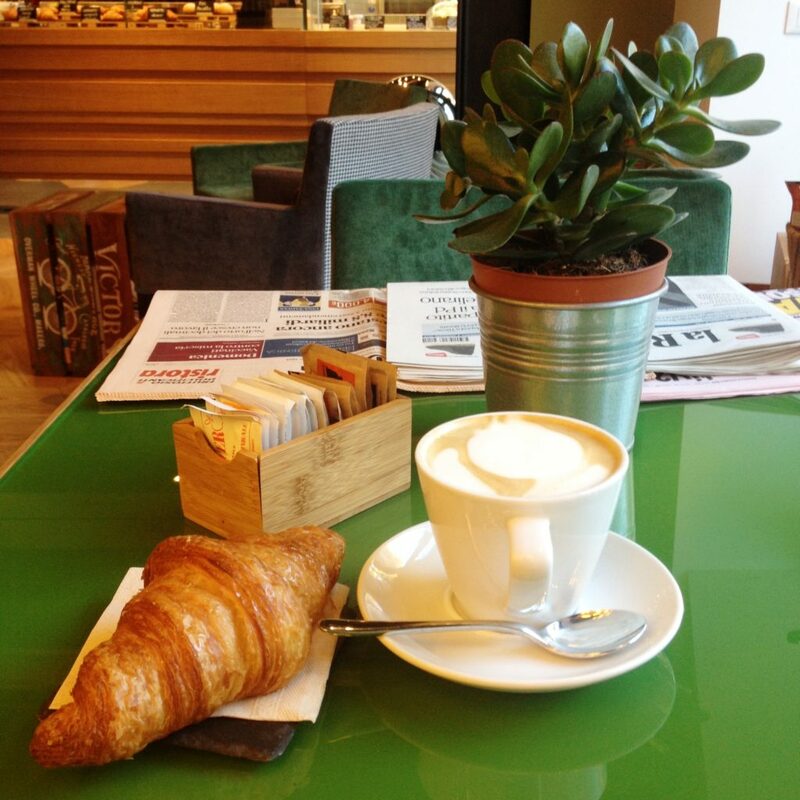 Try coffee from Panini Durini or just go into one of many cute coffee places that are all around Milan! 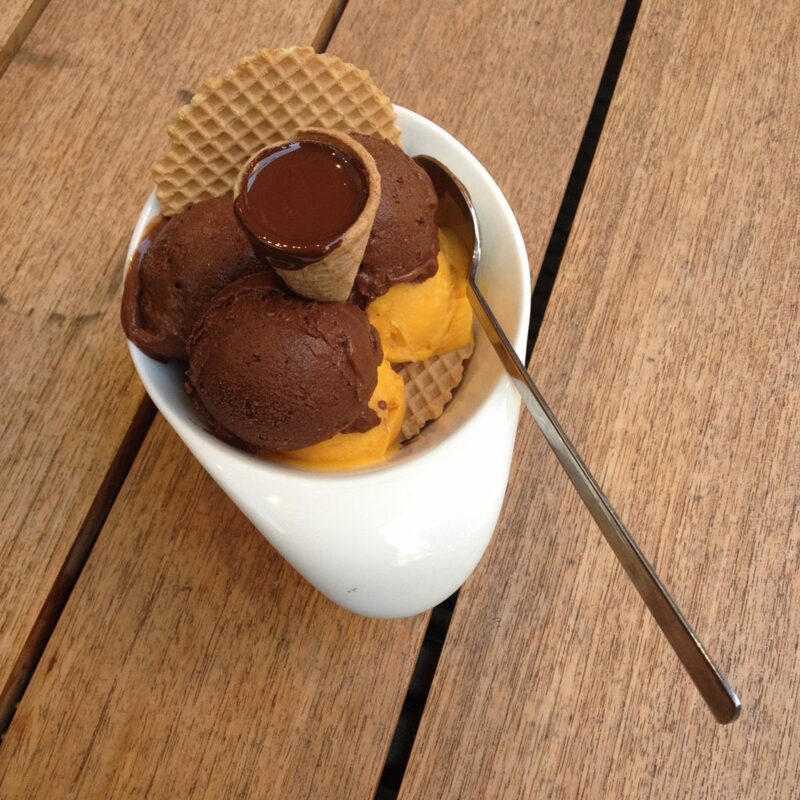 And I know you will wish to get another ice cream, so I suggest going to Cioccolatitaliani. 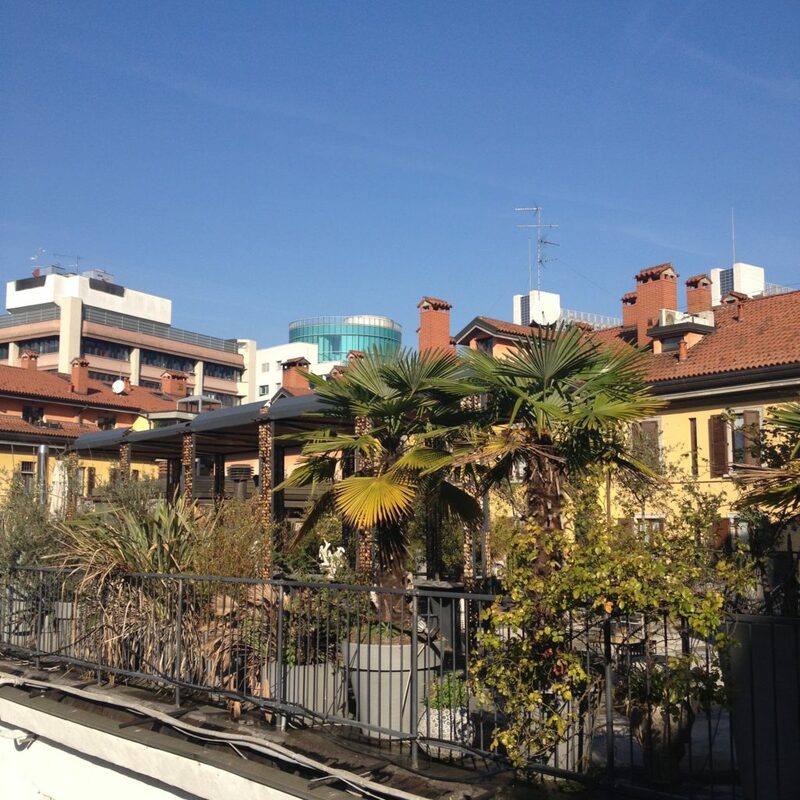 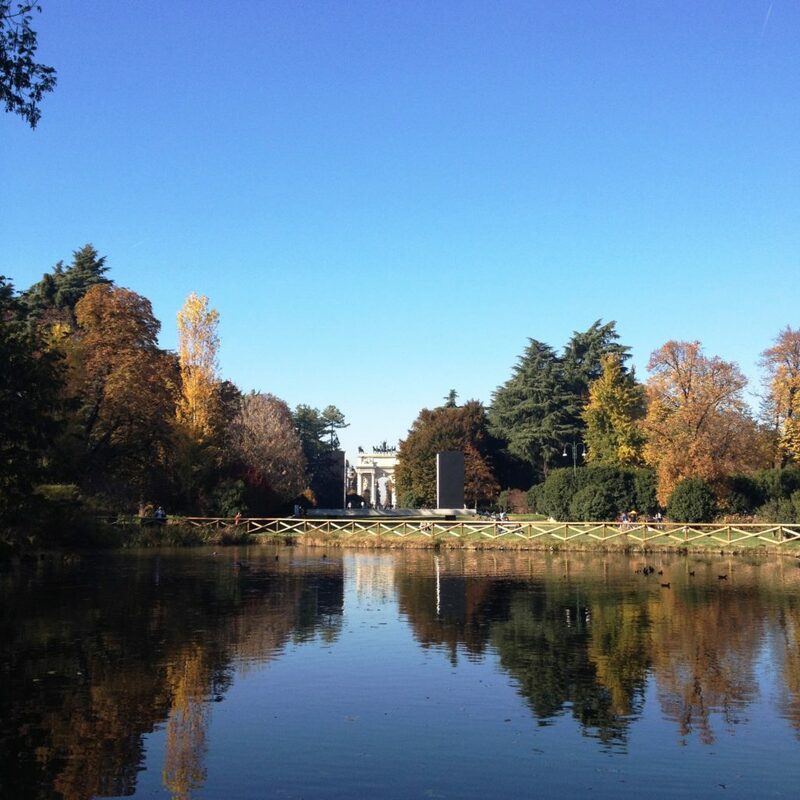 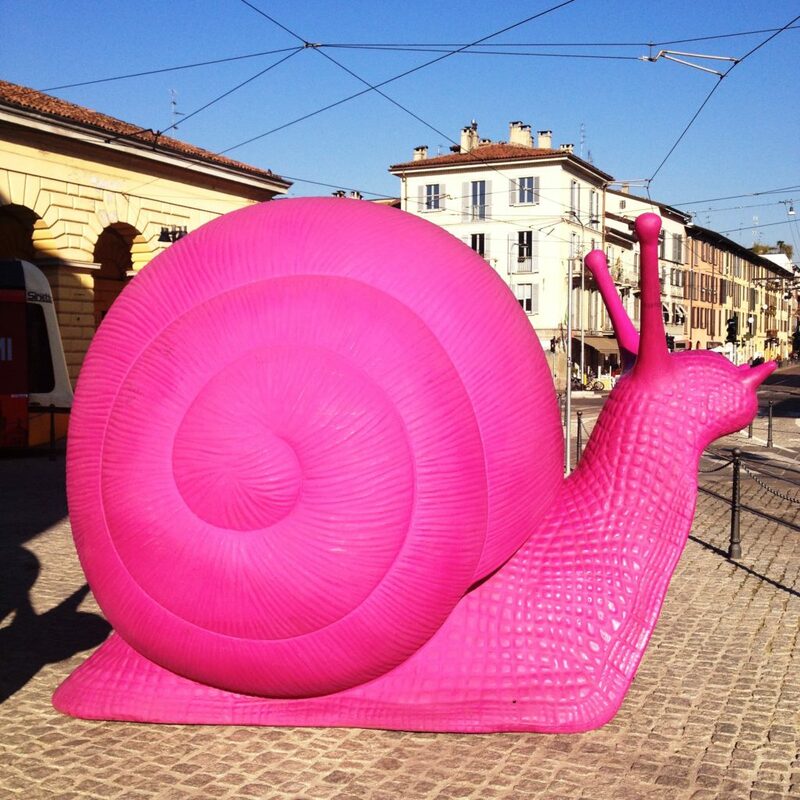 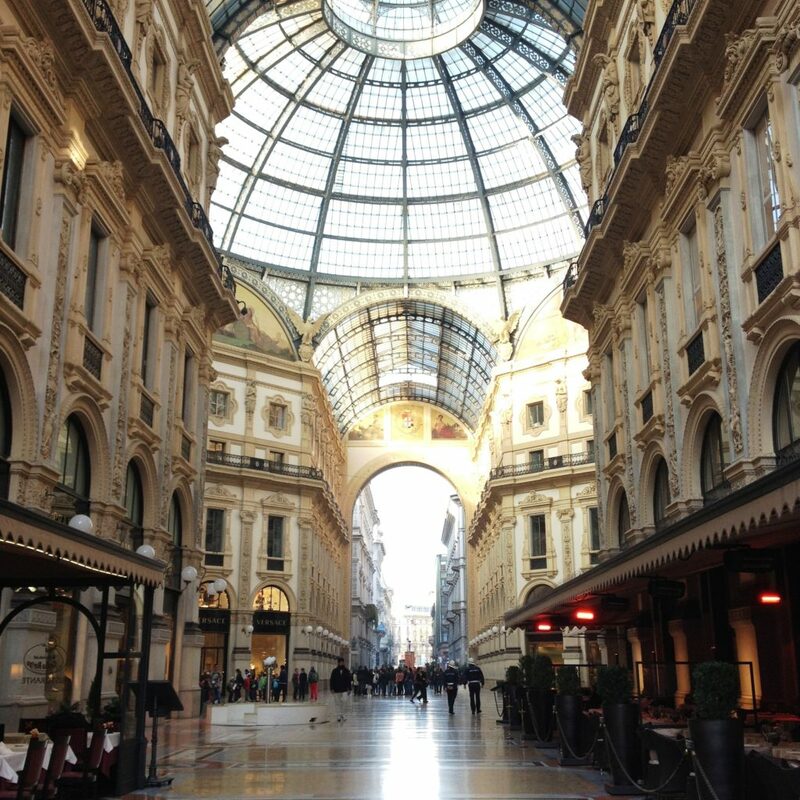 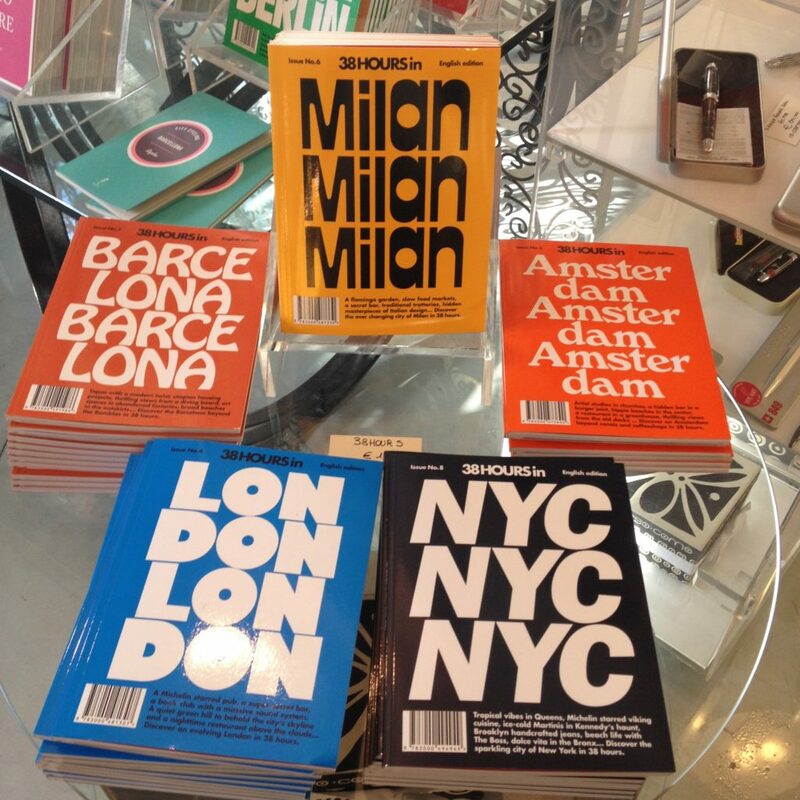 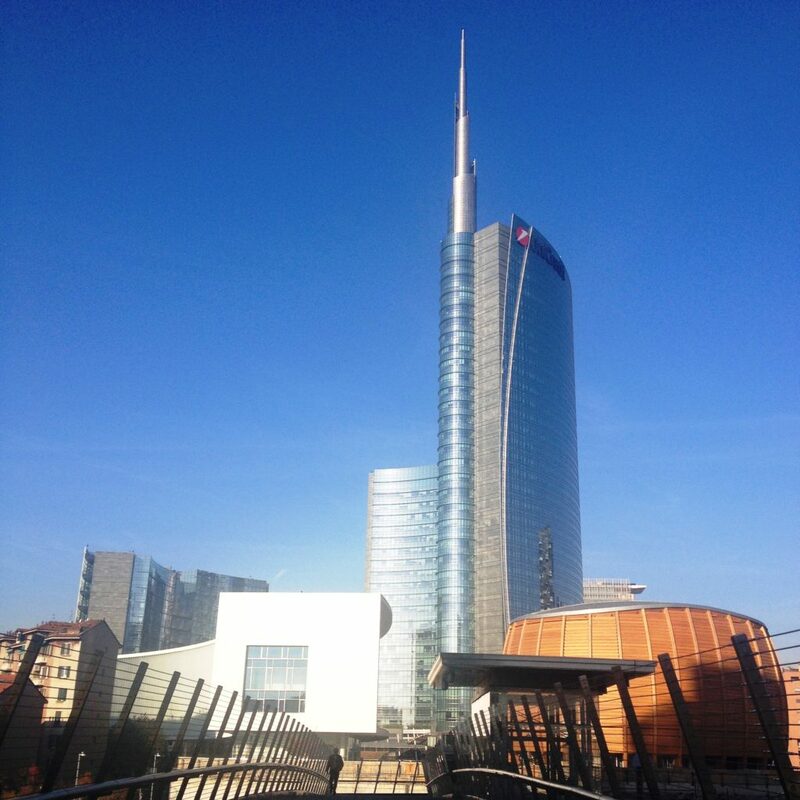 Milan is definitely the city that surprises you: its art, architecture, coffee, culture, fashion, food. 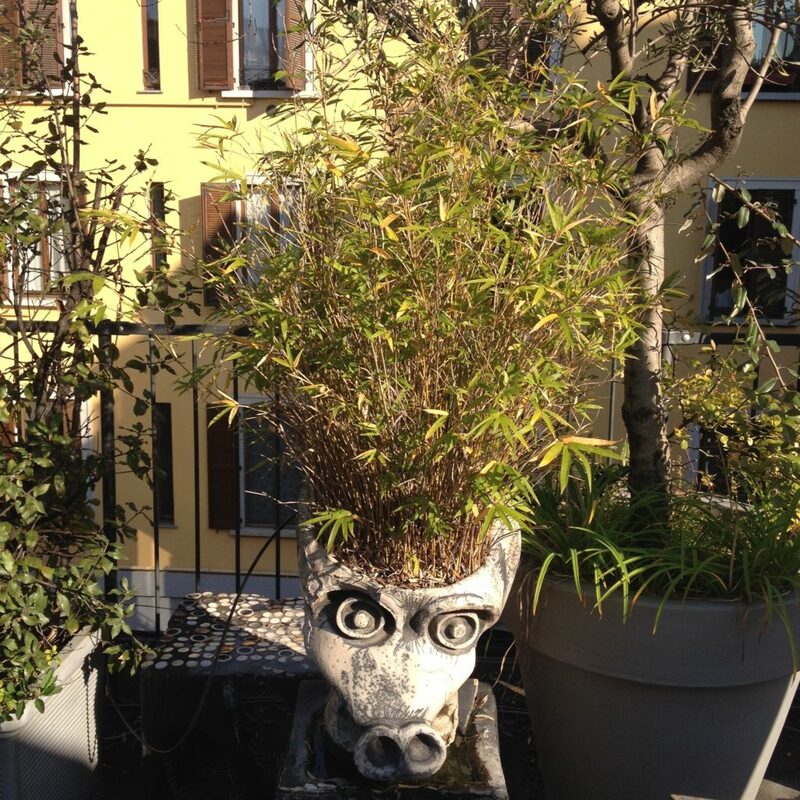 I am adding pictures of two art forms that show its diversity. 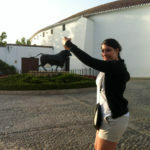 My friends went there and forget to check prices when ordering beer on the main street. 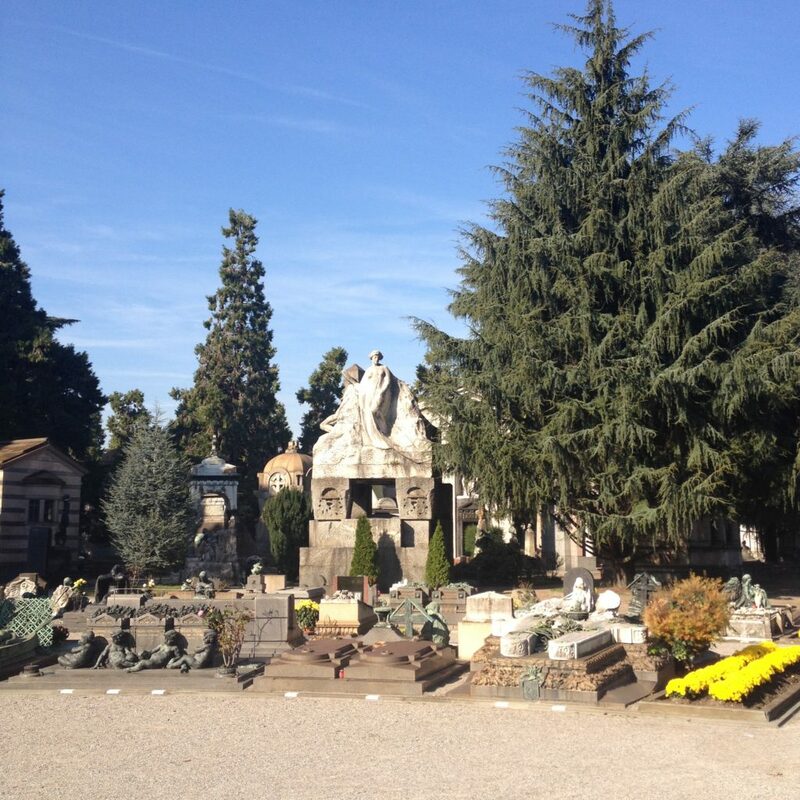 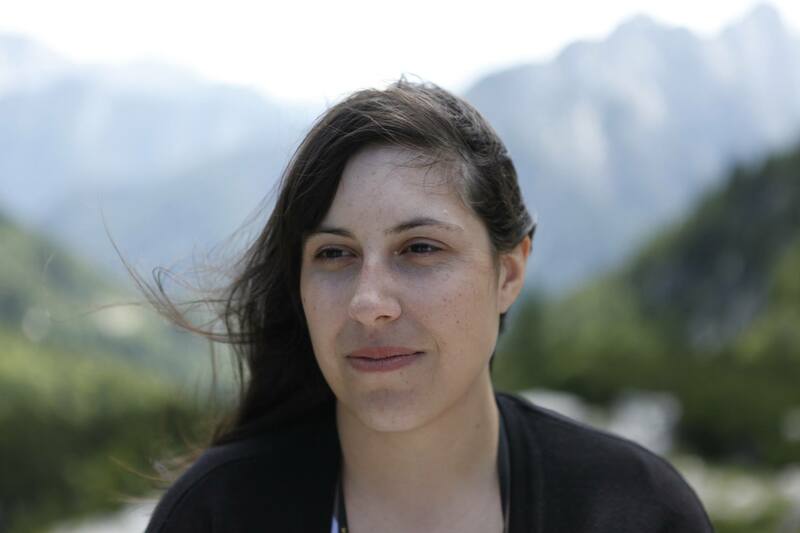 But like Vanja shows, if you are careful, the visit can be on budget. 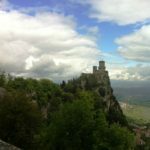 Where in the UK can you drive on the right side of the road?